This classy-looking pouch is the Lihit Lab Teffa Pen Case. 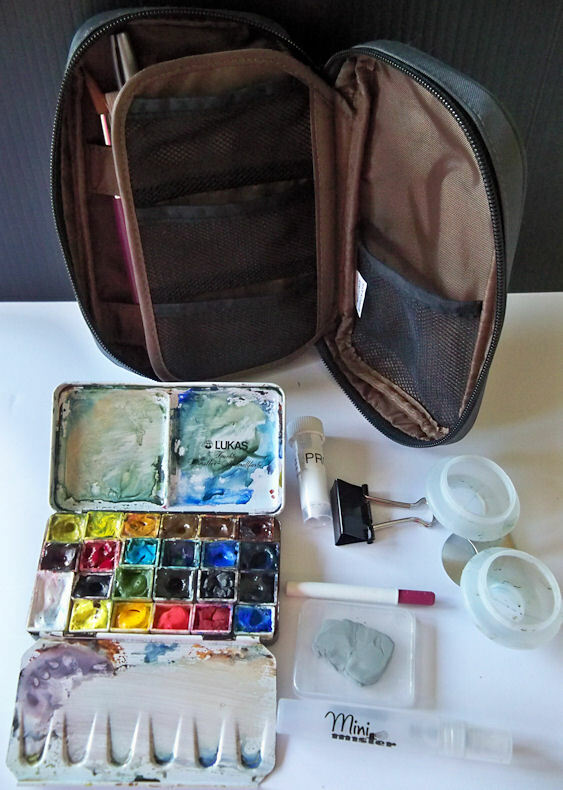 I've filled it with watercolor supplies to serve as a medium size watercolor sketch kit. Most of you have probably seen my recent review of the Nomadic PE-07 Pencil Pouch, which I use as a very lightweight sketch/watercolor kit. That one lives in my pocketbook and I do love it. It's perfect for those unexpected sketch opportunities that come along while waiting for someone or something. 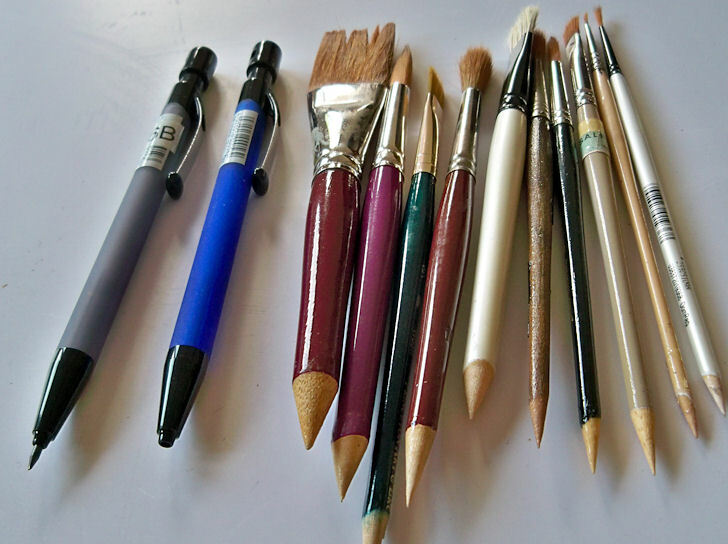 But I do miss my real brushes, as well as my slightly larger palette for those real brushes. 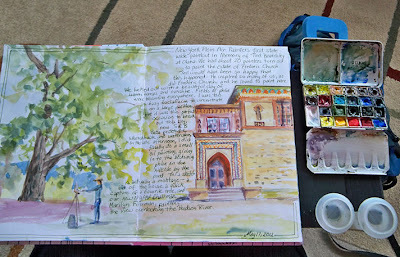 I wanted an additional kit to take hiking and plein air painting, that can work with my custom Arches Rough sketchbook, as well as with the larger 8.5x11" Stillman & Birn books. Those books require the ability to lay down more paint with larger brushes, at least half-pan size paint reservoirs, and larger mixing areas. I ordered this Lihit Lab case to serve that purpose. 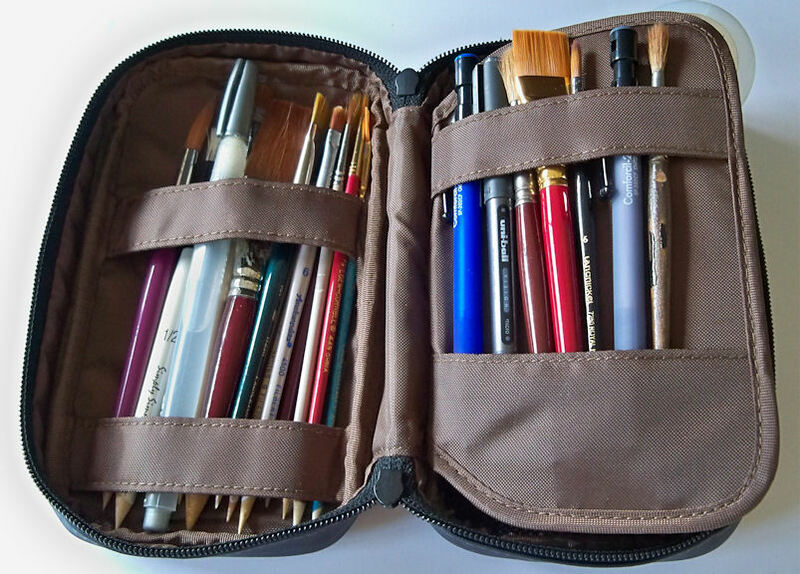 As you can see, the front of the case does a great job of holding my brushes, pencils and pens. I considered putting a small piece of Velcro in the center of the upper strip to hold the brushes in place better. The Velcro would give the brushes more security, but would take up space and reduce the number I could fit in there. I decided to try it the way it is first, and it worked just fine. The brushes were a bit too long and needed help to fit in there. I measured how long they could be, cut them down with a hacksaw, and sharpened the ends with a pencil sharpener so they could be used to scratch out twigs, branches, etc. Then I dipped the sharpened ends in Golden GAC100 to seal the wood. I used old sables and synthetics, since I didn't want to butcher any fabulous brushes that also might get lost out in the field while hiking. On the left in the above image, you can see my latest favorite pencil lead holders. I've always loved 2mm leads, but the ordeal with trying to keep them sharpened made them difficult to use when convenience is a factor. Well, have I got great news for you! 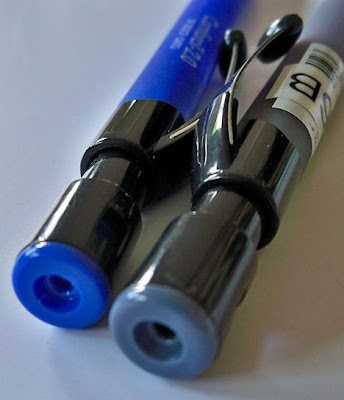 These lead holders come with a sharpener in the end. Yep, problem solved! They are only $3.30 each (and come with a lead) at Jetpens. 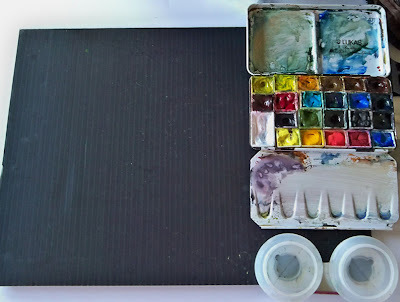 My palette and a Mini Mister slide right into the pocket together at the back of the case, and there's room above them for double clip-on oil painting palette cups to hold my water. By keeping one water cup for warm colors and one for cool, I can get by with very little water. As hikers know, water is both precious and heavy to carry! Opposite those are small web pocktes that I use for holding a mini scrubber (from the pharmacy, for brushing gums/teeth), a little vial of Pro White (in place of white tubed gouache), a kneaded eraser, and a metal binder clip. The empty side of the board then slides into the sketchbook to help keep it secure. You could use rubber bands around the board and page for additional security if you wish or use a large metal binder clip. I can sit very comfortably with everything on my lap this way, and have both hands free. This little, light setup enables me to paint 11x17 without even having to cart an easel around with me! I put a weightless closed cell foam gardening cushion in my backpack and I can sit almost anywhere in comfort. The Lihit Pen Case is the perfect size for this kit. If it were any bigger, I'd be cramming it with more stuff that would be heavy and unnecessary for watercolor sketching. It fits the palette and exactly what I need to go with the palette. No more, no less. I desperately need a squirrel mop brush for this kit, since this setup enables me to go large enough to make use of it. I'll have to buy one or two inexpensive ones to cut down because I am NOT butchering my Rekabs! About half of the brushes I do have in here I won't need. I'm going to whittle down the assortment before I go out again. Keeping the kneaded eraser in a plastic case is a pain in the neck and wastes time. I'm going to remove it from the case and stick it in with the brushes. I love all this information. I am always looking for a better way. Thanks. OMG!!! Those 2mm pencils are a dream come true. I've just ordered two of them and one of the Lihit cases. Thanks for this great post. BTW, I did something your readers might be interested in. I liked your coroplast 'table top' idea from your previous posts but I couldn't fit one in my small messenger bag. So, what I did was take a 10x11 piece of fomecore and cut it in half (5x10). Then I created a hinge using black gaffer's tape and a couple small velcro 'latches' to hold it open. I've only used it a couple times and when I do I sit with the hingetape down. In use it acts like a single piece and yet it folds into a 5x10 piece. Lastly, thanks for spending so much time describing your materials. I've learned so much from your posts. Larry, I've been trying to come up with a way to carry a larger board. "Hinge side down" did not occur to me, and it's a brilliant idea! It should work with the Coroplast also. I'm on it immediately! Thank you so much. Let me know how you like the lead holders when they arrive. Larry, could you describe your velcro latches a bit more? What size, where you positioned them? I love the idea of the hinged board! Jamie, Great review, as usual! For the squirrel brush, you might consider the Rosemary and Co. travel version: https://www.rosemaryandco.com/product_info.php?currency=USD&cPath=274&products_id=978&osCsid=rmbfg9ge8bo3b9ikie1goe6827. It's big enough for small-medium paintings. I haven't tried the Harmony ones from Jerry's, but the price is certainly right ($2.49-$29.99!!)! And yep, I do the same thing with my brushes! Two tools in one! Excellent review, Jamie! You are so creative in putting together perfect setups! When I first saw the photos on Wet Canvas, I thought the pointy things were pencils, yet I couldn't see the tops of any pencils... and now I see they are "sharpened" brush handles! So clever! Tina, I was just telling Kate that she should get the case you have if she wants to affix a shoulder strap! That pointy brush handle was actually Kate's idea. Twining Vine, thank you for the link. I checked out that travel brush, but it's too small. I will probably end up getting the Harmony brushes and cut them down. (They've been in my Jerry's shopping cart for awhile now!!!) I'm glad you enjoyed the review. Linda, what an awesome idea to use bottle caps as paint pans. Perfect! I have gotten so many great ideas as a result of all of the comments on this post! Thank you. Thank you Jamie for all the wonderful info! I was wondering where you found the small collapsible water containers. These look like a very nice size for on the go. The pictures are very nice.Excellent Review!It putting a small piece of Velcro in the center of the upper strip to hold the brushes in place better. 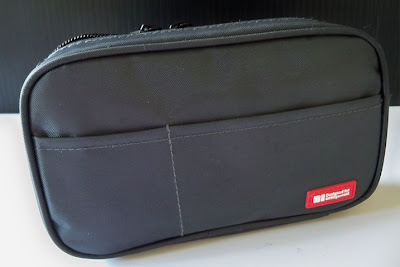 The back of the kit is well designed.At a same place a huge amount of art materials, product reviews, Reviews, Sketch Tips, watercolor,pens were put together.Its very easy to take everywhere. Hi! 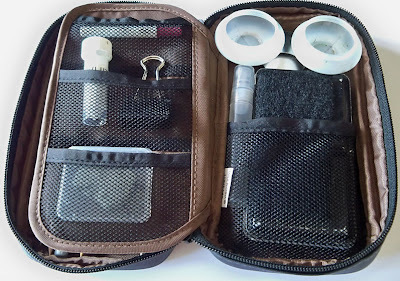 I would love to replicate your travel kit as mine is feeling a bit too small. I was able to find the pencil case, but I'm stuck on locating the palette box. Could you please tell me what box that is? Thank you so much!